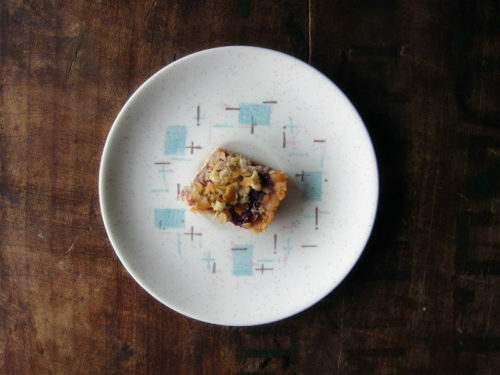 The fact that there are 4 tiny jammy squares sitting in my fridge means that I have serious restraint. I made these bars last week on a whim. I was feeling elated that my cards were featured in Uppercase Magazine (a gorgeous publication that I love & admire) and I wanted to celebrate with a little home baking. 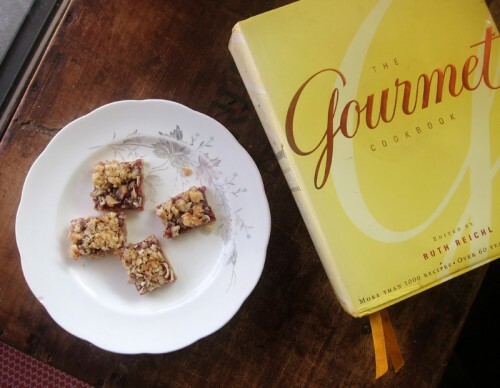 All that week, I found myself digging into my old favourite, The Gourmet Cookbook , dog-earing the pages until I stumbled upon these bars. Coconut. Oats. Raspberry jam. Oh, and butter. These are rich and sweet and totally satisfying. Even though I tend to prefer salty over sweet, I can’t resist the pull of these bars. I cut them up teeny-tiny despite protests from my husband who felt a larger square would have been a whole lot better. I’ll leave the sizing up to you. I also slightly reduced the sugar from the original recipe, but I think I’d reduce even further next time by cutting out the white sugar entirely and cutting the brown sugar to 1/2 a cup. Or use a jam with less sugar. Served alongside tea, these are wonderful and I’d be lying if I said eating one (or two) at 9am with my morning coffee never happened. Preheat oven to 375°F. Line 9×13″ pan with lightly buttered parchment paper. Spread coconut evenly on a baking sheet and toast in middle of oven, keeping watch so it doesn’t burn & stirring once, until lightly golden, about 6 minutes, then cool. Blend together flour, sugars, and salt in a food processor, then add butter and blend until a dough begins to form. Dump the butter mixture into a large bowl, stir in oats and 3/4 cup of the coconut and knead until combined. Set aside 3/4 cup dough to use as a topping. Press the remainder evenly into bottom of the prepared baking pan and evenly spread jam over it. Crumble reserved dough evenly over jam and then sprinkle with remaining 3/4 cup of the toasted coconut. Bake in middle of oven until golden, 20 to 25 minutes, then cool completely in pan on a rack. Lift out the bar onto a cutting board and cut into squares. I like 1″x1″ squares since these bars are sweet, but my husband thought each square needed to be much, much larger. Store in a covered container in the fridge. Yum yum yum!!! 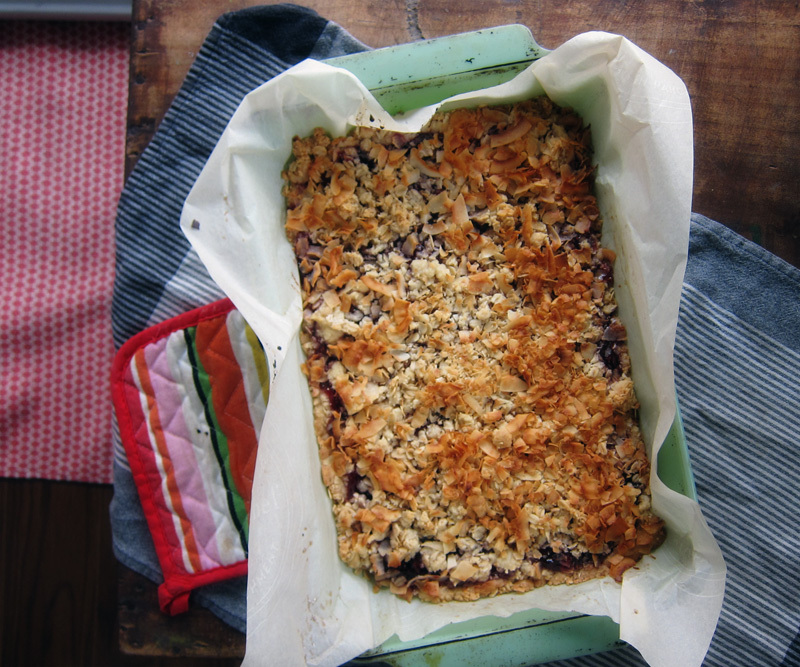 I think this is going to be made (and devoured) this week using crushed macadamia nuts in the crust and the frozen raspberries I have had in the freezer since last summer. And congratulations to the magazine feature too!! Congrats on your magazine feature! That’s so awesome! These are such a great celebratory bar. Love the mix of fruit and coconut! Oh, and these look yum. Pinning them! 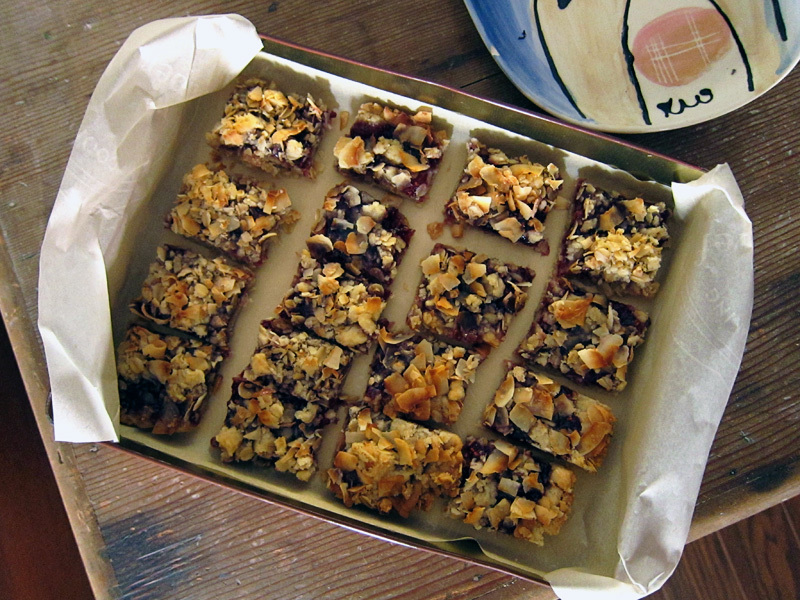 Nicole, I liked them so much as mini squares & my mind works the same as yours – seconds!! Thanks Sarah – yes, these are def PRETEND healthy! Oooh, that sounds amazing, Bijoux! Thanks Joanne, it’s pretty fun being in a great little magazine 🙂 And the bars were the perfect companion. Ha, Lydia, I’m so not a Dr. Who fan – though maybe I should give it a go. When I was a kid, Dr. Who was always playing on TVO and it was so 70s and weird to me. I would love to make these for my daughter, but we found out recently she is allergic to almost all tree nuts including coconuts. Still trying to figure out a substitute for that. Maybe just using more oats in this case. I’ve never had these before, but raspberry is the ultimate, ultimate for me. I’m going to give these a shot! Can’t wait! Barbara, yes, just use more oats! And maybe add a few seeds (if she can still eat things like sesame seeds) to add a bit of interest. Hope it works out! Nicki, I love raspberry too so I’m sure you’ll love these. Coconut and raspberry are such a great pairing!